“Christmas is more than a Celebration. It all began in 2006 with one man and one vision: to share Christ’s love with the poor during the Advent Season. 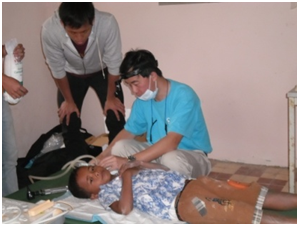 Little did Dr. John Lee and his family know that what began as a handful of volunteers would eventually grow into a flourishing organization. ACTS stands for A Call to Share. It began at Our Lady Queen of Peace parish in Singapore and is now comprised of over 300 volunteers . The volunteers come from various backgrounds. Some are doctors, some are teachers and others work in finance. Some are teenagers; some are grandparents. They all have something special to offer, whether it’s giving vaccinations, teaching English, getting ready for job, power points, Bookkeeping, painting murals or singing and dancing with the children. Not only did the volunteers teach, but they also contribute towards the construction of a secondary new school for the Salesian Sisters in Teuk Thla. 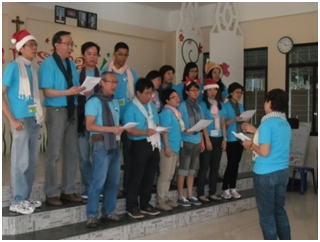 Every year they visited the Don Bosco Schools and Centers of the Salesian Sisters in Phnom Penh: in Teuk Thla, Toul Kork and Phum Chreh. 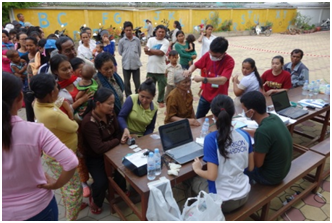 They also extended their medical service in a village school in Kampung Speu outside Phnom Penh. There seemed to be no limit to both their generosity and their expertise. 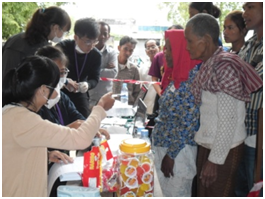 They set up health clinics to offer eye and dental service. They offered a clinic specifically for women’s health and they even provided medication. Most importantly, they offered their time, love and service. The teachers who accompany the Volunteers in their self-giving service, acknowledge that they, too, are on the receiving side since they learn much from their untiring and continuous attention to the young, their eagerness to transmit values and skills with an active, involving and attractive methodology, their kindness and respectful way of dealing even with the smallest child. Many ACTS volunteers said they wished they could only help more, that one week was not enough. But the effect they have on these communities lasts much longer than that. Whether it’s the elderly woman who received much- needed medication or the family who received a bag of rice, the Singaporeans are changing lives. We are filled with admiration at their enterprise and with joy for their presence. We are thankful for all the love and care their response to “A call to share” left behind. We ask God to bless them and their families and we await their arrival next Christmas.